I use this saw regularly and if you actually read the instructions, this saw is fool proof. It makes absolutely straight cuts. I set the orbital control on "1" for most cuts. Perfection! Regarding blade retention, I've noticed that you need to make sure the blade is fully seated in the chuck. It will work with the bade not fully seated, but you run the risk of the blade falling out. Also, the base adjustment does in fact have a detent for 0 degrees. You pull/push the base plate to engage the 0 degree detent. Overall, great saw! I would like to express my experiences and views on the use of the Neutechnik Jigsaw Table that I had purchased recently. I have found it to be a very useful and well designed tool! The reason I chose this Jigsaw Table is because I live in an apartment and am very limited on space and the jigsaw table is portable enough to be set up anywhere. I have found the best combination is to attach it to a Black and Decker WorkMate and it is very stable while taking up very little space. The jigsaw table also acts as several tools, one of them being similar to a bandsaw. I am completely satisfied with this tool addition and have used it to make several projects. The Neutechnik Jigsaw Table is also available with many options to expand it’s use or to eliminate the need for other tools. The Jigsaw table is made of quality and sturdy materials. I have shown my friends this Jigsaw table and they were impressed. I would recommend this Jigsaw Table also because the customer service is one of the best that I have seen! The staff was very helpful and very courteous. Orders were delivered very quickly! I wished all companies were as efficient and professional as they are! Thank you for your Jigsaw Table! Sincerely yours….Des Fong. Irving, Texas U.S.A. Recently I received an email regarding my satisfaction on the Precision Jigsaw Table bought a few months ago and I mentioned a broken knob and that you would transmit to the proper department. To my surprised today I have received not one but two knobs in the mail and even if I had not specificly asked for one. So thank you for such a very good after sale service. Well, I am not the "woodworker" as so many on Youtube. I use the jigsaw rather seldom, but for me the most important thing is that it cuts straight, and it does the job very well. I am 70 yo, and I still need to install the biggest part of my woodshop,because during winter I have other things to do here. But during the summer months I will be busy more with wood working. here are the photos of the 3 projects I have done or about to finish,all have been done on the Jig saw table. I still have not got the jig saw yet,running on a Kawasaki till I get a good one. Project one is the one inch belt sander. 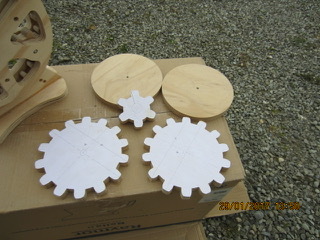 Project 2 is the rope maker with a lot of gears,these I cut with the jig saw table as opposed to the scroll. Project 3 is the miniature hay maker,I have only shown the gears but all the long 48 inch lengths were cut on the jig saw table. Hope they are of interest to you? Just to say that your jig saw table is a great piece of engineering and design! I received it as a Christmas gift and couldn't wait to get it assembled and in operation. It went together very easily with every nut and piece fitting perfectly. A little bit of fine tuning on blade position and it was ready to go, as the ad goes it does 'exactly what is says on the tin'! A real bonus getting the pack of 10 long blades for differing applications, nothing worse than getting a tool (particularly as a present) only to have to go off an buy some other parts before you can use it. Still a lot to learn on how to get the best from it but definitely a big bonus to any small shop where space (and budget) is limited. Thank you very much for your email. I am a hobbyist and use your Jigsaw table whenever precise woodcutting works is required, especially for smaller pieces where using a tablesaw is not safe and a bandsaw is too big to fit into my work room. The jigsaw I use is Bosch PST650 with standard Bosch sawblades, fast cut or clean cut, depending on the case. For a simple example, please find a photo of a sofa sidetable. The plate is Oak, legs are Ipea. The legs were reused from a spare Ipea deck wood (rip sawn). Then I used the method shown in your youtube channel to cut a tennon into each leg's end and to insert it into the oak plate's mortises. Ipea is a very hard wood according to Janka hardness scale, and although the jigsaw had a hard work as the cuts were slower than usual, it was surprisingly accurate. 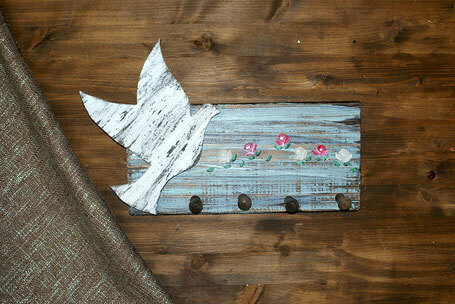 I have used your Jigsaw Table on a number of wooden ornamental items I constructed, i.e. 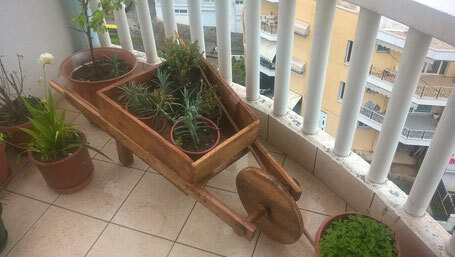 a wooden spoon, a wooden wheelbarrow for flower pots and a wooden handle for a knife (photos attached). The table helped me to cut clear surfaces in the case of the wheelbarrow and shape the handle of the knife. Especially, in the case of the handle, i used a very soft wood and the table was perfect. I also used the table in order to shape a small chunk of olive wood into a spoon. However, it made my life difficult as the wood was quite hard and i was getting a lot of vibration. I used other blades than the ones you provided for free (thanks) but still i was getting a lot of vibration. One other thing is that due to vibration I lost the plastic safety (for the blade) already from the 3rd or 4th use. In general, I mastered the table after 5-6 uses and in general terms I think that the price i paid for what i got was ideal. Thank you for your nice feedback. To cut hardwood is a very hard work for a jigsaw. Therefore you have to cut very slow and you must move the Saw Blade Guide so far down that it is against the workpiece (page 4 last picture of the instructions). Although in time I will need to move on to a full sized bandsaw I have found my jigsaw table very useful. Amongst other things I used it to make this. Managed to assemble it and had a little test of its operation. So far I have found it simple and I am most impressed with its performance so far. I just need to fit the adapter to do circles next but if it as easy as the first try then there should not be any problems. I will recommend this device to anyone who enjoys making anything. PS should I need more blades you will hear from me again. But as I have a lot of blades it will not be very soon. Thank you for your email, and sorry for not replying earlier, but I wanted to finish a project and take a photo to send it to you. a previous small project was making a laptop table, I cut finger joints using the jig saw, the table fence and the little miter fence I were very supportive and accurate, that was really great. My latest project was making LCD TV table, I used the dowel jig to connect the pieces, the result was beyond my dreams, when mounting the sides and find them exactly 90 degrees, and the dowels aligned perfectly. 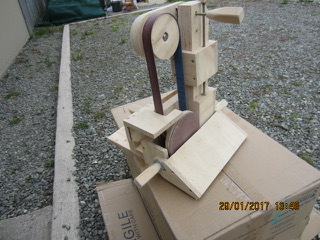 I bought the Doweling jig, the band saw and the scroll jig parts, the next day after transferring the money it was already shipped, one more day and it was out of Germany, it took 10 days in Jordan (Middle East) before I was contacted!, I had to go to the main post office so the parcel would be opened in my presence and a Custom officer, wasting half a day their, paying 30% of the shipment value as custom fees!. - Fine and glossy A3 size manual for the jig saw and scroll saw, with clear font (didn't need my reading glasses! ), steps are covered in details with lot of pictures. - the accurate finishing of every piece confirms that it is (Made in Germany)! Making sure that every part and tool mentioned in the manual is there, I started mounting the Doweling jig first, though it looks small and most of its part is made from plastic, but it was sturdy, and amazingly accurate, I had my first little box that looks like a professional production!. After that I mounted the scroll saw parts, following the manual instruction made the task so easy, first I used my own blades, but they came short and that means I will loose the chance to cutting thicker wood, so I used long one I found it in the box along with other blades, T-type shank and U-type shank, they were in a separate bag labeled (free), I think that was so smart and very considerate - knowing that in my order I didn't ask to buy long blades - but this wonderful gift made working on the jig absolute fun, because the cuts were easy to manage and the results was PERFECT, I wasted a lot of wood pieces cutting in all directions, testing the alignment of the fence and the miter gauge, (actually most of the pieces wasted just for fun, enjoying a crazy moments of precise accurate rip, miter, bevel cuts! ). 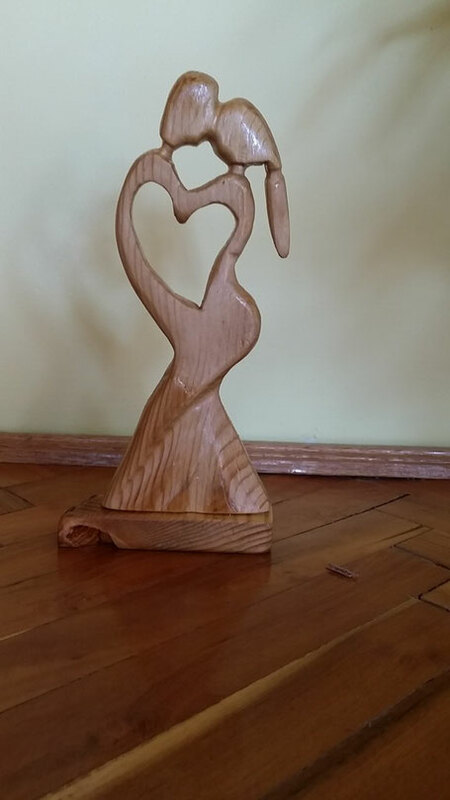 As for the scroll saw part, it was a delicate process, dealing with a tiny little spiral blade that looks almost twice thickness of a human hair, I wasted 2 blades before I got the right tension and the fun began again!. I am satisfied with the hole pack. 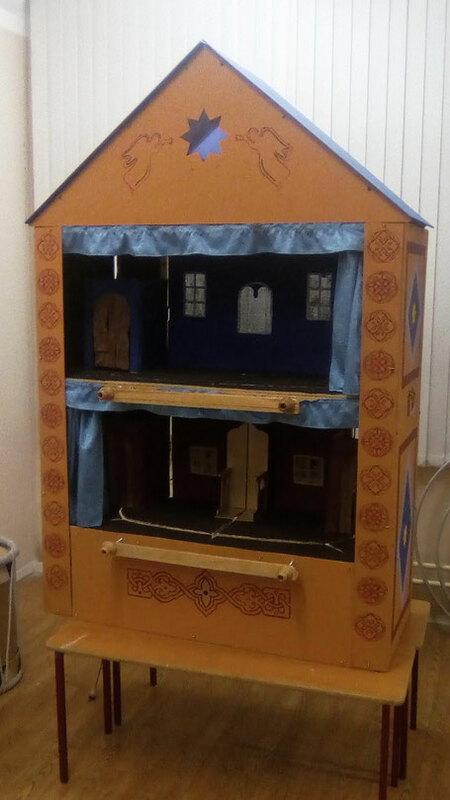 I attached 2 pictures about my first projects. (presents to my wife for 6th anniversary). There are some days you sent me an email asking me to send you photos of work done with the jigsaw table. 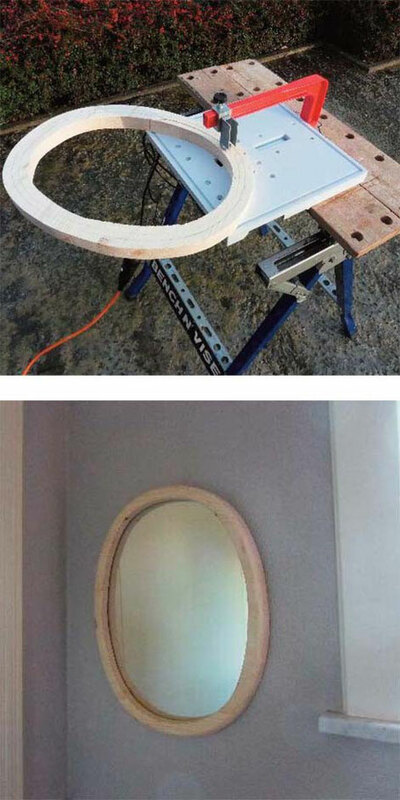 This is a frame for a mirror. This saw makes it possible to cut a straight cut! It’s great! 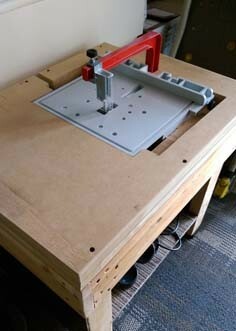 I would like to post my review about Neutechnik Super set jig saw table which i received just before few days. It may fill you that review is some what lengthy but please cope up with it. My self is not any commercial but an Electrical engineer in govt. organization, to construct various electrical, electronics project is my hobby. I do have every tool, equipment required to fulfill my hobby. 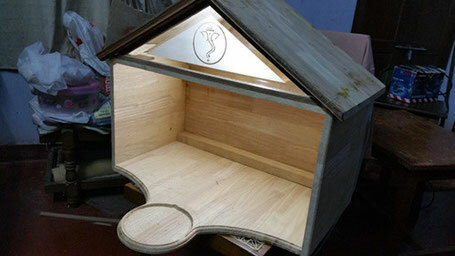 Main problem up till now was to make slots in plywood or in thin metal sheet so as to mount component on it. 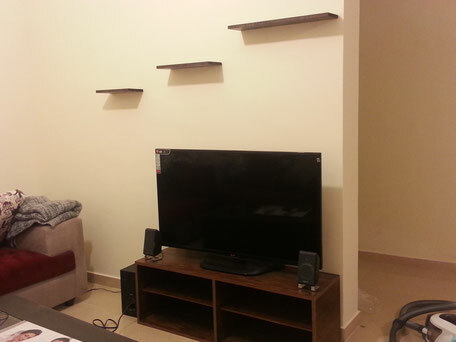 I had to depend on carpenter to do this job for me, many times these people are reluctant to do such out of way job. I was searching for proper device so that i could do this work myself and since from last 15 months i was searching for appropriate device and in the mean time spent thousands of Rupees (Indian currency) to construct what i wanted and all wasted. Then after i came across the name Neutechnik. I opened the page on net and it was pleasant surprise for me to see that it is as exactly as i wanted and imagined. Neutechnik tool shop responded me very quickly and finally i received the Neutechnik jig saw table super set in due course. Build up quality of set is extremely super, every part is perfectible designed. I assembled it and tried few cuts it worked perfectly. Only issue is i could not get suffecint time to make practice but even after that i construed one project with the help of Neutechnik jig saw table within one and half day otherwise it would have taken several more days to finish it. Even if cuts are not as perfect because it was very first attempt of me but it served my purpose beyond my exceptions and i am very sure within few more days i will be able to work as good as professional. Really works as shown in youtube video. Many many thanks to Neutechnik tool shop. As the same time i want to know that why neutecnik do not produce other devices like mini portable drill stand, guides for cutting tools, tool holders etc. because material they use is very sturdy and precisely shaped. Yes, I received the jigsaw table and have used it successfully. I am very pleased with it and would recommend it to anyone whose space is at a premium. I cannot let you have any photos at present but if I make something that shows the device's capability I will forward them to you. Thank you for your follow up, a rare professional consideration these days. I don't know whether you have a market in Sweden, if not I would suggest you approach companies like Bauhaus or Jula as the Swedes are very much into Do It Yourself projects. Nice of you to follow up on the after sales. 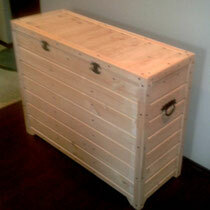 A bit about myself, I like doing wood hobbycrafts at leisure, not a professional by trade. I live in a small apartment where space and noise is a constraint. Moving on to your jigsaw table, I waited with much anticipation and was pleasantly surprised with the quick delivery time. Very reliable on your part. Upon receiving it, I temporarily set it up with the given instructions and made a few cuts, straight, angled and free hand. It turned out wonderful. Just as in your YouTube videos. However, as I've mentioned earlier about space and noise, and being a hobbyist, I have not done any projects yet with the table. But for the table, I made out a bigger table out of scrap wood so that the jigsaw table can sit on it and I've also line the walls with thick carpet to absorb, contain and reduce the noise of the jigsaw. This was in consideration of your table as I was afraid of the stress level on it when cutting, weight and vibrations come into play. Once it's done, and soon I hope, I shall send you pictures of my mini projects. Meanwhile, I have attached some pictures of the table I mentioned. I use it to cutting PCB and it work better than mini table saw. I just wanted to give you some positive customer feedback. I bought the Jigsaw table with accessories a few years ago, and its precision cutting capabilities have helped me revolutionise my working life. I now run my own business, creating candle lit boxes, which allow the viewing of removable slide designs. I currently sell on Folksy as ‘Myglowbox’. I couldn't have achieved the cutting speed, with precision angle adjustment to produce the parts needed, without the Jigsaw table. Hopefully I will be outsourcing the production of the parts next year, but I will continue to use the Jigsaw table for the creation of new ideas. Hello,.....sorry for late info after received two packages. Thank you very much for free saw ......, good packaging, very fast shipping and etc. Until now I have not yet assembly all of this , what I have done are just check, touch, observe and I am sure that it is very high quality material 100% made in Germany, I am very happy, impressed ......... wait for couple days in national holiday then I would assemby and try it. Just info, I am employee in Panasonic after sales service as Technical Support Supervisor in Head Office . But, I am very interested in woodworking, for those I have many woodworking tools, finally you upgrade it's as perfect tools, recently I am really wondering how can you have ideas then create it worthed price? God bless you to have brilliant brain, thanks to know you. By the way, I have many times experience buying online on ebay, ali (for microcontroller board, electronic stuff) from Hongkong and China , what they described and promises in the web are untrue compared with the real fact. I am very upset and dissapointed with them. But, ..... It's delightfull to deal with you again in the next time. Thanks, I got the package last Friday and started using it Sunday. It was easy to setup, but I forgot to fine tune it when working on it, the work piece got a bit out of alignment. However, it was fix at the end, and fund out the design of the jigsaw had a tilted blade angle so it was not strait on the work table. The plastic cover got a bit too dusty to see where I am cutting, maybe with vacuum attached it will solve the problem, very nice and sturdy design though. Finally thanks for the free blades!! I was thinking of ordering them after the shipment has been done, and kind of regretting it... until I opened the package and a nice surprise!! Thanks again! I received jig saw table with the saw blades. on youtube; it is accurate in cuts. I am very satisfied, and once again thank you. I am very satisfied with your Jigsaw table, it is very well constructed and has a lot of multifunctional applications. As a result purchased two of your products. Unfortunately my usage of the table has been limited to very boring tasks and nothing I could consider to be worthy of note (a lot of simple recutting). I look to do more creative works in the coming months and happy to share at that time, if it is of interest. An interesting proposition for you is that I have an import and distribution company with some good contacts in high volume purchase hardware retail stores in Australia and New Zealand. I believe that your product are high quality innovative items that are would be an interesting proposition for my contacts. Do you have interest in this opportunity to discuss further? or do you prefer small volume orders? Ma commande est bien arrivée, parfaitement emballée. L'appareil est parfait. Je vous remercie. Best regards. I have received my two missing parts and would just like to thank you for your prompt , pleasant and efficient response to my problem. Thank you for your interest .Yes I am very satisfied from my Jigsaw table.makes my work much easier . I am satisfied with the Jigsaw table. It fulfill my expectations. I have made a few shelves and a cabinet with it. I am pretty happy with the jig saw table. I made a little modification by drilling holes on the table to fix the jig saw directly with screw instead of the plastic clips for less vibration when using the scroll saw attachment. 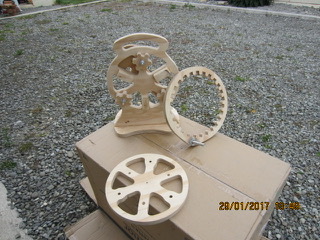 It take some time and patient to perfectly align the saw blade to perfect right angle, but one done the effect is very close to a real scroll saw. My kids are very happy seeing, touching and pulling the toy i made for them. I'm very happy to inform you that I've just got the package. Sorry about the false alarm. But when I saw the delivered status on DHL tracking, I thought it was lost. Oddly, the mailman brought it instead of DHL truck. Also, if I may add a comment, your jigsaw table is such a quality, well-engineered product. Frankly, I had my share of doubt when ordering because of the plastic material it was made of. After assembling, I realized I don't need to worry about it at all. Thanks, once again, for making such a great product available. Thoughtfully designed, well engineered, quality built, just one of the best tools I've purchased in years. My Jigsaw Table Super-Set arrived very promptly, well packaged and without any custom duty payable, albeit some time ago. The extra long blades were greatly appreciated. After following the assembly procedure (making all the fine adjustments as illustrated) in the instruction manual I was easily able to set up the table system. The table has enabled me to cut clean, square and straight work pieces for the first time in my “hobby project life” which was so exciting. I have used the jigsaw table a few times now and am very satisfied with the system. I have also set up the Saw Dust vacuum system which has made the working environment so much cleaner.... brilliant addition! Thank you all at Neutechnik-Werkzeug-shop, your customer service has been excellent. I have used the jigsaw table for a few months now and am totally satisfied with the use and quality of the item. I keep it permanently set up with the extension arm in place so that I can use it to cut wide material. The table has allowed me to use a previously under utilised jigsaw as a bandsaw/chop saw/tenon saw. The only problem I have experienced is the connection of the vacuum hose to the top of the support bearing, the vibration keeps throwing the hose off the top. It could be that I have high vibration on my OLD jigsaw but the connection is only a push fit, maybe it should be a screw fit. I have a bandsaw but it only has a 10" throat, whereas this table enables me to cut wider boards. Very practical piece of kit, well designed and manufactured. i have already made a lot of different cuts, and i found my way. i have put two pieces of laminate floor wedges between the blade guide and the red arm, and is perfectly solid. using orbital mode in the jigsaw, the ripcuts are perfect and fast too! almost no need to sand!!! i made some scrollsaw cuts too, as it is, and they were good too. you are right. the circle guide is perfect! Thank you so much for sending the spare part (rubber connection). It was very generous of you and I appreciate it! This is because I find that I cannot do mitred cuts (beyond a certain angle) with my jigsaw table mounted within the table. Also, I sometimes like to do wood cutting work out-station, and of course that would require another unit, as my base unit is not mobile now that it is mounted within the table. so that I can complete this new order. Thank you very much for your great product. I have been using the jigsaw table and it works really well in giving straight and accurate cuts. It is an extremely handy tool to have. The table arrived with the complimentary blades a while ago and I've used the table for producing some jigs at my garage after spending some time juggling and fiddling about finding the right settings. The table is sturdy and when set right, it cuts the workpieces, even 30mm and thicker boards in the right angle and line. I could easily say that it reduced most of my needs for a table saw. Therefore I would recommend this cost-effective product to any fellow hobbyists who have limited space in their workshops. The extra blades were also a life-saver while it can be sometimes tricky to find long ones. Thank you again. Happy new year to you. Sorry for the delay in replying to your email I haven't been very well lately. I am very pleased with the jigsaw table although I haven't been able to use it as much as hoped due to poor health. I have been feeling a little better recently and been doing some home renovation. The jigsaw table is proving to be very versatile and useful with some of my home renovation projects. I made a nice window cill from some up cycled wood this week to replace an old tiled cill. I really like the ability of the table to cut very thin and precisely. I might purchase a new jigsaw to leave permanently attached to the table as I found it a little fiddly to keep putting it on and taking it off when I just wanted to use the jigsaw on it's own. Also the small square black plastic blade safety guide insert sits slightly proud of the table and was causing a slight obstruction to the work piece, I resolved this easily though. I have some ideas for making jigs of my own that I can attach to the table to help make it even more adaptable. I have many projects planned for when I'm feeling better and I will let you know how the table is performing. This is my second review, as it is almost a year since I purchased the jigsaw table- super set and it has seen a fair amount of use. As you can see from the attached photos, I have mounted the jigsaw table to a solid wooden table and have been using it almost entirely for making cuts in wood. The cuts have been clean, square and straight, and vibration has not been excessive. The parts have lasted well (I was initially apprehensive that plastic, even ABS, is not the most durable material for this sort of application)....the only part which might soon need replacement/repair is the rubber connector for the vacuum system which has developed a crack. Nevertheless, I hope that you will one day develop a metallic version of the entire system. I have been using a Black and Decker KS900EKX jigsaw, which is an excellent machine, but the inbuilt blower has prevented your vacuum/suction system from working properly. So yesterday, after almost a year of frustration, I decided to open up the jigsaw and attempt to disable the blower or divert the air. I managed to plug the outlet vent near the blade with some wads of rolled paper, so now the fan blows the air harmlessly out through the side of the jigsaw. Today I made my first cut without blowing sawdust all over the place, and this has given me some satisfaction. Hence this second review. I just received the jumbo set and play with it all day : everything is perfect and easy to set up. Will recommend this set to all my friends because it really worth it. My first two trial cuts were not satisfactory only due to misalignment of the base plate of my jigsaw. After careful alignment making sure the jigsaw blade is vertically and horizontally correct with respect to the base plate, the Jigsaw Table now works perfect. I have owned my Black & Decker jigsaw for 35 years and had never been able to get professional looking cuts. Your Jigsaw Table turns it into a very useful tool. 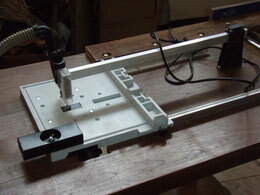 I use Jigsaw Table mainly to cut arm boards to mount tonearms on turntables playing vinyl records. I am very happy with purchase Jigsaw Table. During this time I made a chest and flower boxes for a balcony. Pyrites long boards were necessary are longitudinal. WithoutJigsaw Table table it it would manage to be made accurately and precisely. 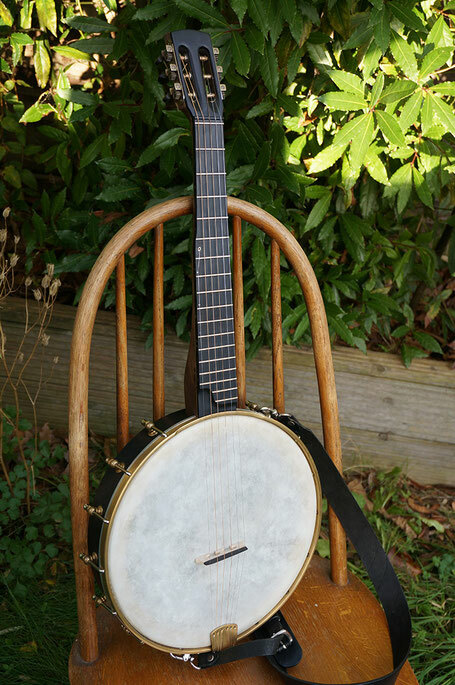 I want to share: precisely to saw lengthways, it is necessary to expose fret saw turn precisely. The simplest way - to saw trial preparation, to check width at the beginning and at the end - and to adjust the angle. Thank you for your follow-up. The Jigsaw Table is everything you claim on your website. I'm very impressed with it's accuracy. However, the jigsaw that one uses is important for quality of cut. I recommend a Bosch jigsaw and also their blades. I would also suggest that you consider designing the Jigsaw Table so that it can accommodate thicker wood, since the Bosch jigsaw blades are currently available in lengths up to 300mm. I definitely recommend the Jigsaw Table to any one because much of the skil with a jigsaw is already built into the Jigsaw Table. The jigsaw table is first class! It has seen much use since I got it and the quality is excellent! I especially like how it allows cuts of perfectly straight lines and curves of intricate design without 'wandering off' the line. A very clever and well made quality item, thanks! Me Haribaabu Naatesan from India. I just received the Jigsaw Super set. I am very excited to use this product. Thank you very much. Never expected to receive the parcel so fast. That too not paying any customs. And it was well packed. Just to let you know that I have received the table set. Very excited!!!! 18/08/2014, saw table arrived today, how quick is that? only ordered a few days ago. It is a brilliant piece of kit. Well made and works well. Thanks to Neutechnik-Werkzeug-shop. hi reinhard. my order has arrived. thanks for this. this product is german engineered product and materials are very high qualty.